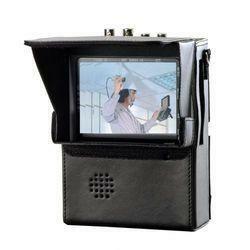 TFT408LCD - Installers 4inch Colour Hi-Res LCD Test Monitor Kit. Test Kit comprising a high quality 4.1" LCD Panel integrated in a case and Sunshield. Lightweight and easy to handle on site. Composite Video Input and Output on BNC Connectors. Audio In and Out on Phono Connectors.